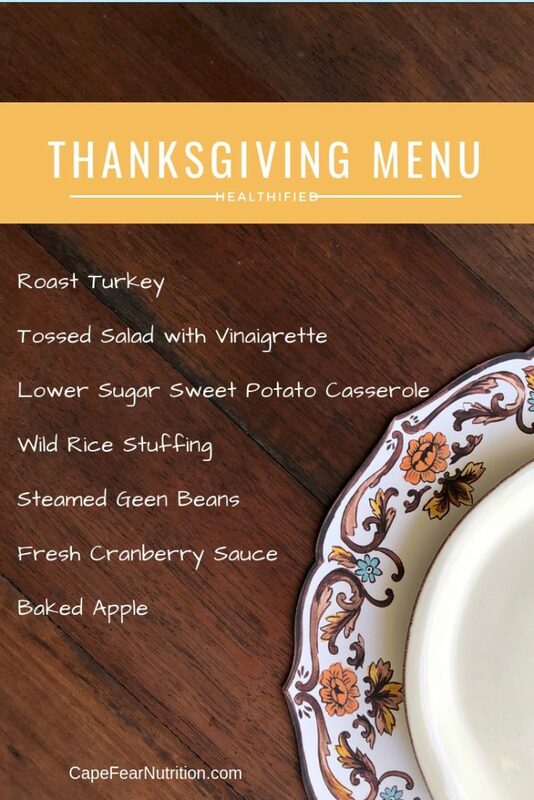 A menu for a healthier Thanksgiving has more vegetables, a whole whole grain, and less sugar. I did something I never do, I calculated the calories, and macronutrients of the Thanksgiving meal I’m serving at my house on Thursday. It may surprise you, but while I perform nutrient analysis for my clients and on individual recipes, it’s rare that I calculate or track full meals of my own. So why now? I did this to back up my claim that this is a healthier meal. I took one serving of the above foods for calculations. Here are those serving sizes: 4 oz. roast turkey; 2 cups tossed salad with 2 tablespoons vinaigrette, 1/2 cup lower sugar sweet potato casserole; 2/3 cup wild rice stuffing; 1 cup green beans; 2 tablespoons fresh cranberry sauce, 1 baked apple. That said, here ‘s the break down (insert drum roll): 927 calories, 118 grams carbohydrate, 36 grams of protein and 38 grams of fat. Whew, that sounds like a lot, right? Well, consider this: the Calorie Control Council estimates Americans consume upwards of 2000 to 3000 calories at their Thanksgiving celebrations. Now, my 927 calorie meal is looking much slimmer!